14 reasons why we're going to miss Nokia | What Hi-Fi? With the sale of Nokia's mobile phone division to Microsoft all but completed, we look at some reasons why the market just won't be the same without the Finnish firm. Barring any last-minute hitches, US computing giant Microsoft is now the proud owner of Nokia's mobile phone division. And with the €5.4bn acquisition all but completed, it feels like the end of an era with the Nokia name expected to walk off into the sunset. Long before Apple iPhones, Samsung Galaxies and HTC Ones were seen as must-have mobiles, we had the pioneering 1011; the buccaneering 3210; and the roaming 7110. So here's our homage to Nokia's best and brightest with our weekly Friday rundown. No, the Nokia 1011 wasn't the first mobile phone on the scene. It wasn't the first GSM-enabled (that's 2G if you want to talk Gs) one either. But it was the first mass-produced GSM handset when it came out in November 1992. 3. But sometimes too innovative? If you think that fitting one of today's phablets into your jeans pocket is a real challenge in itself, how about this curious device. It's the 7600 and its camera was the real selling point, but its other specs weren't quite as hot. You were never more than 50m away from someone who owned a Nokia 3210, so the legend goes. OK – that isn't actually true, but this was an incredibly popular handset; it sold over 160 million units after launching in 1999. With a rubber shell that acted more like Kevlar and split in half at the curve beneath the screen, none shall pass the 5210! Throw this handset at a wall and it'd still come back for more – our Content Ed can vouch for that. 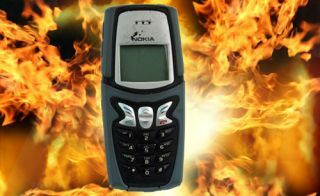 We're not sure what reason you'd ever have to use a blowtorch on a Nokia handset, but it'd be a waste of time. Just remember this defiance next time your touchscreen decides to crack under the weight of your finger. Oh yes, with a Nokia handset, we were all DJs back in the day as random number and letter combinations somehow produced passable polyphonic tones. It was like our own little game of Name That Tune. Back in 1999, using the internet meant sitting at home with a clunky desktop hooked up to a modem – provided no-one was on the phone. The Nokia 7110 was the first to bring WAP to a mobile phone for information on the go. Nokia's N95 – the first smartphone as we've come to know it? If the iPhone didn't arrive in 2007, we'd surely talk more about this handset. It set high standards with its Flash-enabled browser, 5MP camera and more. 11. Battery life? Days. Weeks. Months. A quick Facebook check, a nifty game and maybe the odd spot of email – that shouldn't use up 20 per cent of the battery on a morning commute, surely? Nokias rarely had that problem – the true Duracell Bunny of mobiles. We're doing a disservice to Nokia here, because clearly none of their phones were this big (or maybe they have?). But the phone gag from Trigger Happy TV here owed much to Nokia's now-classic ringtone. 14. But still, Go Snake!